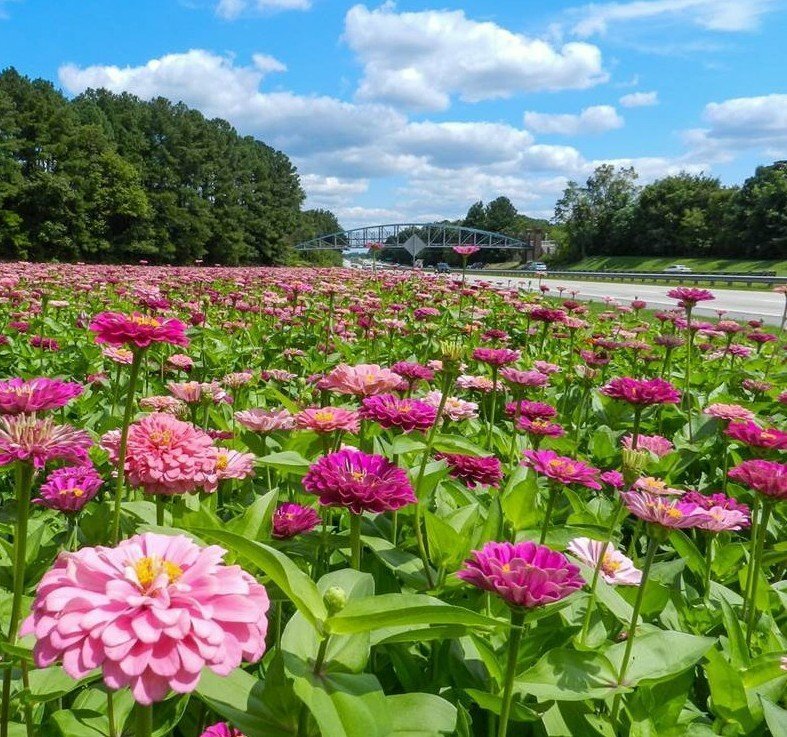 “This is fascinating – what can we do to get this sort of thing started in North Carolina?” With these prophetic words, First Lady Dottie Martin inspired the North Carolina Department of Transportation to begin a roadside wildflower program in 1985. What started as 12 experimental acres has grown to include plantings along interstate and primary routes across the Tar Heel state. With additional encouragement from the Garden Club of North Carolina, the North Carolina Wildflower Program now encompasses 1,500 managed acres using one-third each of annuals, perennials, and North Carolina native wildflowers. One hundred percent of these wildflowers are grown from seed, not plugs or root stock. Working with the North Carolina Department of Agriculture and Consumer Services, North Carolina State University researchers, and much trial and error, today much more is known about planting, managing and maintaining wildflowers than in the early years. Managing grasses and undesirable broadleaf plants is the key to a successful program, and these cooperative efforts help achieve the desired results. 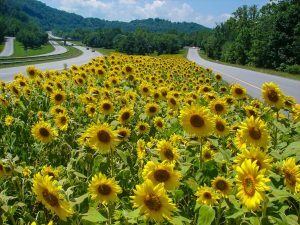 With 30 years of experience, roadside employees know which flowers bloom in sequence. By planning specific combinations of flowers like red poppy, California poppy, and toadflax, they manage to increase the span of blooms on individual sites. And by planting ‘meadow-effect’ beds, the plantings appear to be natural and unplanned. In contrast ‘special effect’ beds show the creativity and ingenuity of the crews installing the plantings. Revenue generated by the sale of personalized license plates plus donations are the principle source of funding for the North Carolina Department of Transportation Wildflower Program. The program is a keystone to North Carolina’s travel and tourism industry, which is the second largest industry in the state with an annual economic impact of over 18 billion dollars. For more information, visit the North Carolina Wildflower Program. Photos courtesy of the North Carolina Wildflower Program.